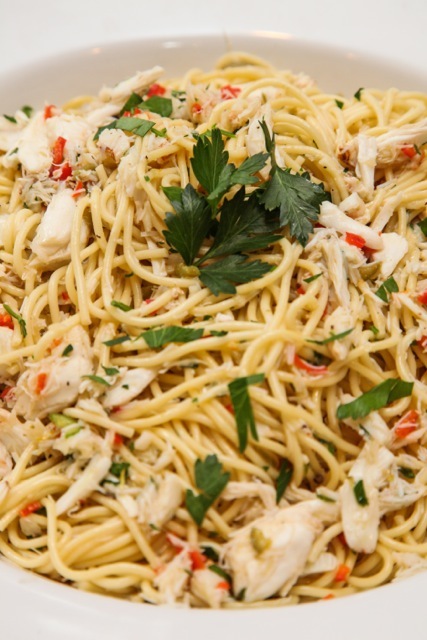 Featured in Foodie Crush Magazine and Summer Spaghetti with Crab and Chiles! 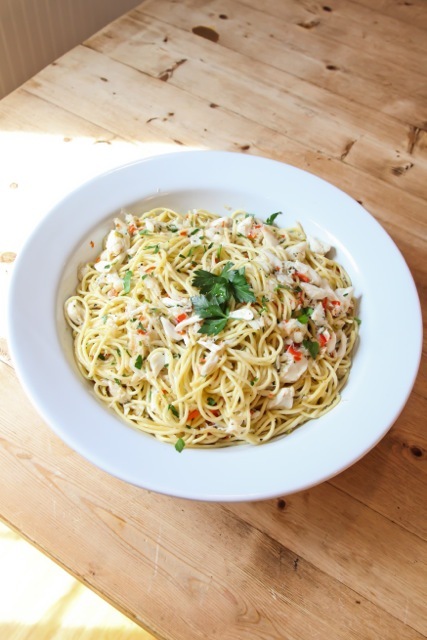 Along with my interview I included my original recipe for Summer Spaghetti with Crab and Chiles. Here is the recipe. Bring a large pan filled with water to a boil. Season the water with salt. Meanwhile, heat up a large sauté pan with olive oil. Add the crushed garlic and shallots to the pan. Season the garlic and shallots with salt and pepper. Cook for about 2-4 minutes or until lightly golden brown. Remove and discard the crushed garlic cloves. Add the chilies, white wine and butter. Bring this mixture to a boil and let the wine reduce. Taste the sauce and adjust the seasonings. Fold in the crab and take the pan off the heat. Cook the pasta until al dente (according to the package directions) in the salted boiling water. Reserve about a cup of pasta water in a bowl (you won’t use all of the water, but it is better to have the water in case you need it). 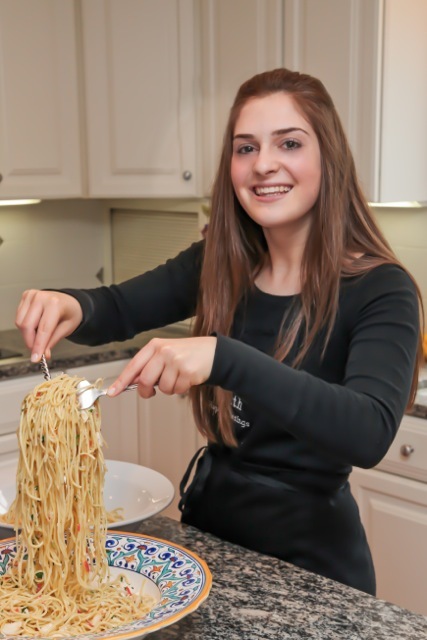 Drain the pasta and add it immediately to the sauce in the sauté pan. Return the pan to the heat and briefly cook until the pasta absorbs most of the sauce. Add some pasta water as needed. Next incorporate the parsley. 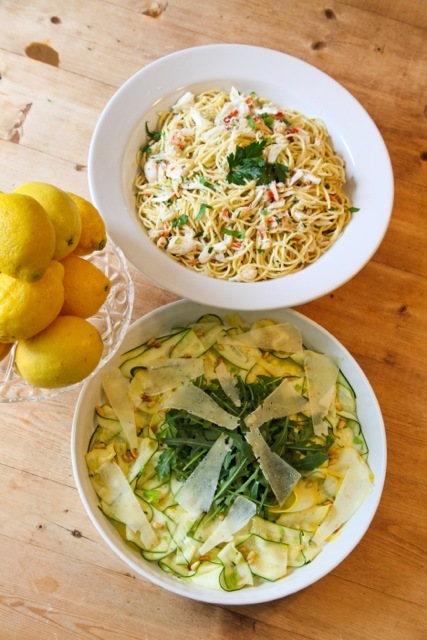 Pour the spaghetti into a serving bowl and top with more parsley, a drizzle of extra virgin olive oil and lemon zest. Eat and enjoy! 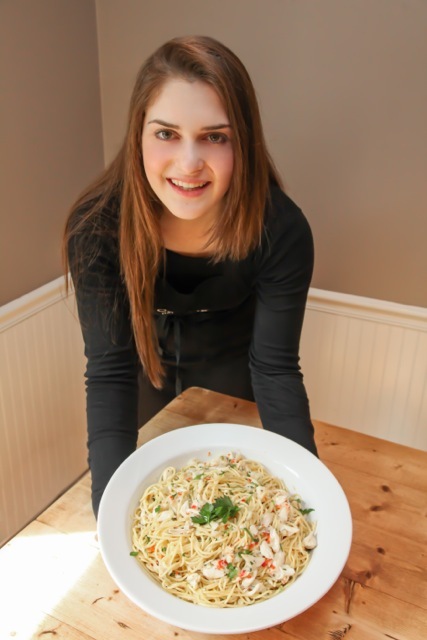 This entry was posted in Dinner,Other,Recipe by Catherine Amoriggi. Bookmark the permalink.